Cross sector creative partnership, Future Screens NI – a collaboration between Ulster University, Queen’s University Belfast and local industry partners – announces £13 million investment to secure the future of the creative industries in Northern Ireland. The new Creative Industries R&D partnership has been established to accelerate growth through new product development, services and high value skills for jobs in a flourishing sector. With a multi-million pound investment from the Arts and Humanities Research Council (AHRC) and funding from industry, the £13 million Future Screens NI venture is the largest single investment in the creative industries in NI. This innovative partnership brings together Ulster University, Queen’s University Belfast and industrial partners at the forefront of the creative economy. The academic collaboration behind the venture is also behind significant project proposals for the Belfast Region City Deal. Responding to industry needs, Future Screens NI will deliver expert technical skills, opportunity and growth across film and broadcast, animation, games and immersive technologies and industries. Through the partnership, Northern Ireland’s creative companies will develop strategies to collaborate, grow productivity and maximise their global potential, delivering new jobs and a £400 million increase in GVA to boost the local economy. Addressing challenges and building on existing strengths in creative industries in the region, areas of focus will include narrative and storytelling in digital content, applications of VR/AR in health, tourism and engineering, development of a games nexus, expanding capacity for large scale film and TV production and enhancing the high level skills pipeline in 2D and 3D animation. “Future Screens NI is a unique opportunity to bring together our creativity with the expertise of industry partners to create a step change in the growth of a thriving sector with huge potential for our economy. The partnership will transform innovation and job creation across a range of exciting disciplines; and with creative industries hubs in Belfast, Newry, Coleraine and Derry~Londonderry, the impact will be region wide. 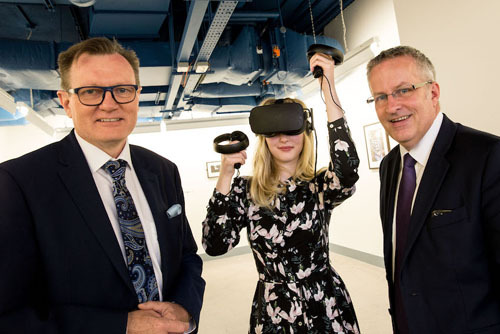 Ulster University’s Belfast campus, a long-standing creative hub for the city and region and home of the University’s founding school of design, today hosted a showcase featuring the market promise of virtual reality and immersive technologies, the flair of animation and the thriving games industry. “At Queen’s University Belfast we are delighted to collaborate with our colleagues at Ulster University and our key creative industries partners, who are crucial to the creative economy in the region, on this timely project supported by the AHRC. “Combining world-class arts and humanities researchers with our globally renowned creative industries will underpin growth in this vibrant and rapidly expanding sector within the UK economy. Future Screens NI will place Northern Ireland’s creative industries in front of international markets and work with government and other agencies to create sustained growth. The collaboration is one of nine research and development partnerships in the AHRC Creative Industries Cluster Programme, part of the Government’s Industrial Strategy, bringing together dynamic creative industries with world-leading university research talent. Ulster University is also a partner in a new Policy and Evidence Centre for the sector led by global innovation foundation Nesta, with partners across the UK. The Centre will connect organisations in the creative industries, research communities, and policy-makers to develop independent evidence and analysis that can inform decision-making across the industry and underpin future policy decisions.